Grab a chair and head to the creek to watch the cool, clear water pass over the rocks at this superb getaway. Countryside living has never been easier than in this sophisticated, creekfront cabin. This tastefully decorated home will have you returning year after year to get your Georgia-Mountain fix! Walking through the front door, you'll immediately feel welcomed and comforted by the plush furnishings and cozy fixtures. Have a seat by the fireplace while you enjoy cuddling up on the couch with your honey for a movie night after a long day of adventures. This living room has all you need to feel comfortable and at home. The fully equipped kitchen welcomes you with everything you need to prepare your mountain-time cuisine. Enjoy your tasty cuisine in the beautiful adjacent and open dining area with a farmhouse table offering seating for 6. This home continues to impress as you make your way into the bedrooms - The entry level offers a spacious Queen Bedroom with a common bathroom with a jetted tub/shower combo. The upper level Master Bedroom boasts a King Bed, a flat panel TV, attached bathroom with a tile shower. Come down to the lower level for another spacious and charming bedroom a set of queen bunks,and a common bathroom with a tile shower. On this same level, discover a fabulous den with a pool table, dart board and Flat Panel TV, cozy furnishings, and a wet bar with pub table and bar seating! Perfect for an evening hangout! In the afternoons, nearly any time of the year, enjoy a toasty evening outside by the fire pit telling stories or roasting marshmallows. When it comes to outdoor space, this home does not disappoint. With plenty of yard space and a clear, rushing creek, it's no doubt that everyone will find somewhere top connect with nature, no matter the weather or season. Let's not forget the hot tub; the perfect place to relax in the bubbles under the stars. 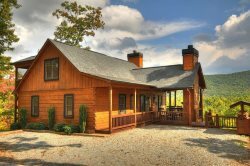 This cabin is certainly not lacking when it comes to making your dreams of a North GA retreat a reality. Located in the Epworth area just 20 minutes from downtown Blue Ridge or McCaysville shopping and dining. We had the time of our lives and Blue Ridge is fabulously charming and so full of activities to enjoy. Being with nature grounds you to your basic energy and allows for transformation. THANK YOU!!! This cabin is so cozy, charming, full of good energy. The surrounding area as well as the interior of the cabin are all we needed to be perfect. We would love to stay there again. The staff was amazing ! They were always available anytime we had an issue. They were quick with the responses so we never felt neglected in anyway during our stay. Overall, this cabin was AMAZING ! All the amenities was above average. 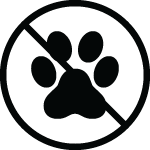 The amount of land the property was on was great because it provided a lot of privacy. It was a great change of scenery to relax and spend time with family. Very attentive. Beautiful, clean property. Brining in the new year at Clearwater Crossing was a memorable and beautiful experience. Relaxing, taking in the peace of nature, and making memories with family was quite a treat!